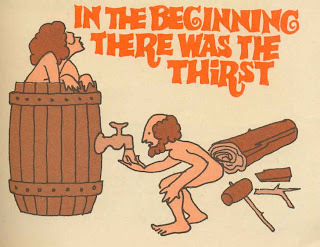 Who will quench Adam’s Thirst! Ban on beer ads must go! Booze has been here for a pretty long time and will be here as long as men are here! Ban on beautiful ads is the issue. This article is a journey through good old times when ads about booze were not banned they educated people about the quality of beer! 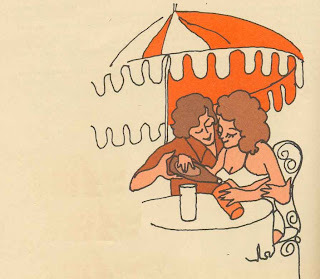 The author always had been attracted by the good ads; those on booze in particular. Those were so wonderful pieces of art, beautiful girls with eyes stoned as if in a trance and macho youngs and olds half inebriated yet proud and keeping their cool. The gentleman’s face tells the whole story! Some ads were so classical works of art just browse and throw seemed to be so cruel. They deserved a cool place in the book shelf for occasional reference and enjoyment (please remember what Keats has sung “A thing of beauty is a joy forever”). It is pity the insensitive government has banned the booze ads altogether, they could ban ads for conveying any socially wrong message or obscenity but that was not the case. Some beer to the beers! Both for tropical and polar! 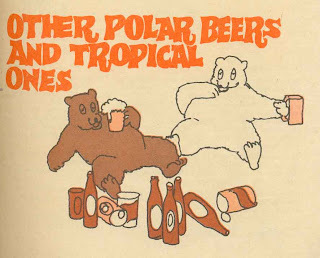 The following is one of the old ads about a brand of beer with good images and top class literature. It is a pity that details regarding the artists behind this great ad were not available hence could not be furnished (contents slightly edited). Your palate too has its pride – don’t sully it. Know for yourself what the latest in fermentation technology is brewing, in beer there is a new flavor to rave about to roll down the throat. 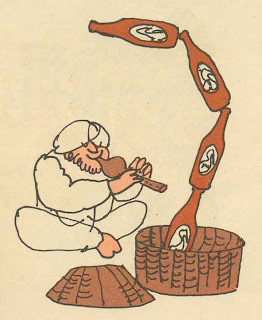 Your taste buds are sweet on the tip of your tongue and bitter on the sides; therefore the beer aroma comes through only when you roll beer down your throat in copious draughts. Don’t sip it; it’s no cocktail! Even after savoring Eve’s apple; Adam’s hunger alone had been satisfied – not his thirst. So he roams the earth with his un-satiated thirst. You would agree that lately the Adams have been thirstier, so we (the brewers) decided to kill two thirsts with one bird by naming our beer after birds (Rosy Pelican just one). Our prediction is; in the beginning there was a thirst, in the end there will still be a thirst! 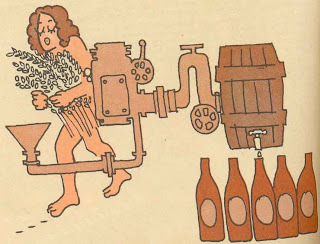 The first form of beer was Babylonian “kurmi” an exquisite thirst quenching drink drunk at festivals - both by men and women. No hops were used in this beer. 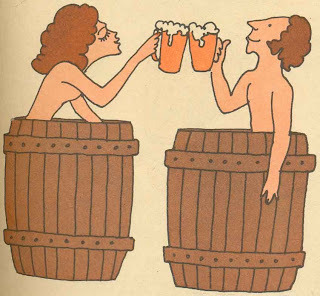 The Romans took over the formula and made their beer from North African barley. The same qualities were sought in their beer as in their favorite birds; an attractive head on sparkling color. That is what we look for today. Lager beer, Ale Porter and bock are some of the different kinds of beer. The kind brewed in India is called ‘Lager’ from the German ‘Lagern’ ‘to store’. This is prepared by ‘bottom fermentation’. Malt is used for brewing and it begins its life as barley carefully grown and ripened. It is then dampened with water, allowed to germinate under controlled conditions and finally dried and cured. The color of the beer can be controlled. Maybe it is news for you but the strength and color of beer have no relationship. Sugars for beer are manufactured from cane. Hops are specially grown for brewing. Only the golden petalled corn is used for its resin and oils. Even the water is treated with mineral salts and yeast, of course, is living organism which ferments the beer. Ale (any beer other than lager, stout, or porter) is mainly of British origin brewed by top fermentation. Earlier, it was made without hops and drunk fresh. Higher fermentation and storage temperatures are used for ale. Stout, first brewed about the end of the 17th century, is strong, dark and heavy with a pronounced taste of roasted malt or barley, usually heavily flavored with hops. Porter beer, (dark brown bitter beer brewed from partly charred malt) made with the soft water of London was drunk by the London porters and is lighter than stout with a heavy creamy foam. Bock originated in Einbeck (Germany). It is brewed in winter from the sediment of the fermenting vats and drunk in spring. Just as beer can go to your head and control it, you too can control the head of the beer. When pouring, the bottle should be held above the glass, which should be in a vertical position and absolutely dry. The beer should be formed to form a head of about one and a half inches at the bottom of the glass. The glass should then be tilted and beer poured down the side to regulate the head as the beer level rises. This operation should be finished off with the glass in a vertical position, with about one fourth of an inch of head. At no time should the neck of the bottle actually touch the glass or the beer because that is no way to make two ends meet. The best glasses should be big enough and completely grease free (detergent to be used with hot running water). An oily glass reduces the retention and adhesion of the head. Some people, of course, would rather lose a head to retain another – the choice remains yours. 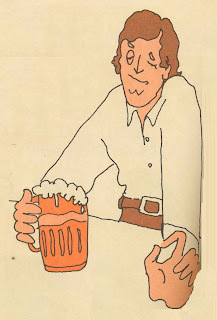 Ideally, Lager beer should be served at 7 to 10 Degree C if its flavor is to be fully appreciated. Don’t use thermo meters! Just see that it is chilled as you would love it. Store in a cool and dry place (as recommended on a bottle of medicine). Beer should be stored away from sunlight, if placed in a refrigerator; it should be taken out only to be drunk. Keeping it out to make space for other things in the fridge is injustice and an insult to the class of this royal liquid! Never dare to do that. Statutory Warning. Alcohol in beer is injurious to health. Declaration: This article contains 0% alcohol and 100% taste. merci pour la visite chez Vivencias... thank's visiting my blog Vivencias!!! To Biby: I'm glad you like my blog, but how do you understand it? You speak Spanish? Anyway, this post about beer is so interesting. Thanks for leaving the comment! I have found our website very interesting. Is it all stories from Kerala? I will be dropping by more often now and look forward to some light hearted banter. I have been hooked to your blog for a couple of days. and this article is excellent, you have really turned beer drinking into an art and the connoiseurship of pouring out beer was also quite exquisite. lanuage is quite smooth, flowing and unconstipated.